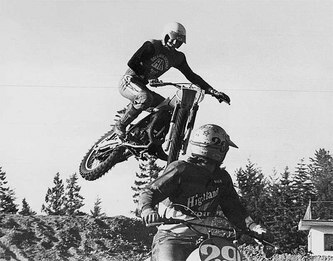 Pat Jacobson was the northwest’s last great hope for a national motocross champion. After a torrent of northwest talent in the early to late ’70s that has never been approached since – with names such as Rick Burgett, Chuck and Ron Sun, Jim and Ron Pomeroy, Buck Murphy, Rick Poulin, Mark Gregson, and many others – the river has dried up. It has dried up so far that only one rider from Idaho qualified for the 125 or 250 Nationals at Hangtown in California this year. 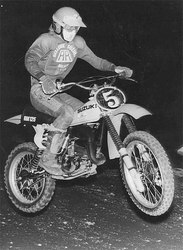 The last northwest rider to make an impact on the National scene was Pat Jacobson. He was young, and he was so fast it sometimes scared you. He had watched and learned from his predecessors, and had raised himself to a new level. He would become the greatest racer the northwest had ever seen and, apart from one brief brush with death, one of the best that the world would lay eyes upon. I look back now on the endless Cycle News stories of Pat winning all three Pro classes from Idaho, Oregon and Washington against some of his heroes. Then he tackled the United States on a privateer production Suzuki in a world of genuine factory bikes and racers, and went head-to-head with them. Then in an instant when all his dreams were coming true on a factory Suzuki, they were gone in a wisp of air – never to be seen again. I was going to college at the time of Pat’s accident, and money was non-existent, but I still got together $25 to send to Pat’s family, with a note. Pat’s mom replied with a wonderful note that I still have. Pat was five years younger than me, and at the time I only knew him by sight. 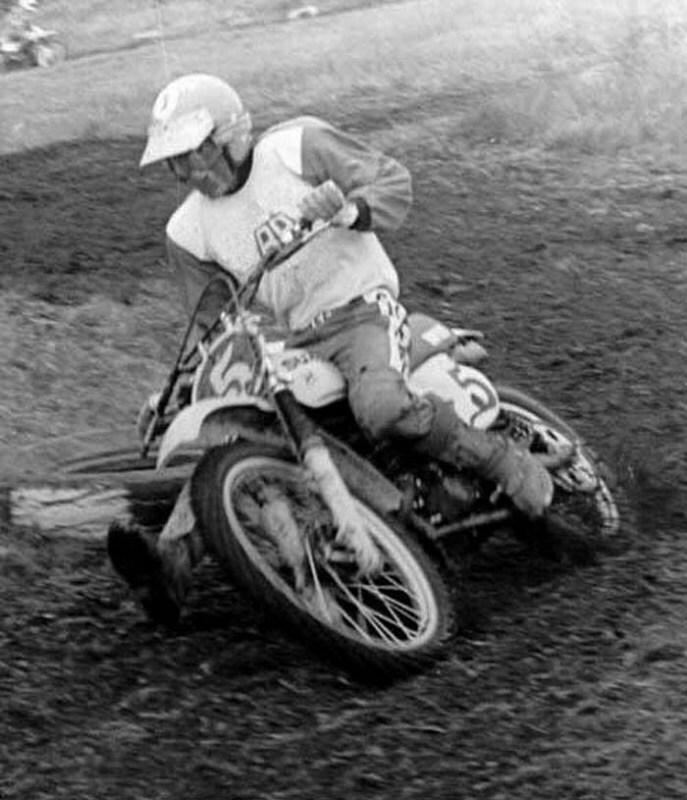 In 31 years of racing or watching motocross in the northwest, he was the best racer I have ever seen. Bench Racer: How important was your family to your racing career? Pat Jacobson: My family was great. My dad, my brother Preston and everybody in the family were just great in supporting my racing career. I remember sitting on the starting line of Straddleline (Thurston County ORV Park) for my first ever race, and my brother Preston comes up and tells me, "Don’t worry, you’re just as fast as any of these guys. Don’t worry. Don’t be scared." After that first race, though, I didn’t want to race anymore. My dad came up to me and told me he’d get me some pads, because I was getting hit all over with rocks, and they hurt. Then my dad gave me a little pep talk, and we stuffed socks over my knees and my shoulders to keep those rocks from hurting when they hit me. After that pep talk it gave me the incentive to keep racing from then on. By the time I was twelve, and had my own bike, I had figured out that racing is what I wanted to do with my life. There was nothing else that was as much fun or interested me as much as racing. BR:Did you have any sibling rivalry with your older brother, Preston, over racing? PJ: Absolutely! When I was 13 and he was almost 17 I felt I could beat him (of course that really wasn’t the way it was at the time). I was racing the 100 A class and he was winning the 250 A class, but I never really got a chance to go head-to-head with him in the same class. One time in a Grand prix at Buckley where the top two finishers in the 100, 125, 250 and Open A classes raced against each other for 25 laps, I got to go against him. I was on a 100, and they gave the 100s a head start – Preston was let out second to last for being on a 250. I was leading for the first five laps and then it started to snow (blizzard), and I flipped over in a corner and Preston went by me and won the race. Preston got married and started a family when he was 17, and that took up a lot of his time. He also liked to party a little bit more. He made a comeback on my 125cc practice bike in the Pro class when he was almost 22, and I was 18. He hadn’t raced in almost four years and he struggled real badly in the first moto, and I lapped him. In the second moto he did a lot better and I didn’t see him. BR:What moment in your career is most responsible for elevating you to the top? PJ: The first thing which comes to mind was that Westcoast Factory Operations (WFO) sponsored me when I was 15, and helped me a lot with my Honda CR 125. The biggest thing, though, was the next year, in 1977, when I started to race for Bellevue Suzuki. It gave me a 125cc bike and 10 per cent off on parts, which was a big deal back then. Then the guys came to see my first race and changed their minds, and gave me a full sponsorship ride. Lauren Olson, the owner, and Greg Olson (no relation), the head of RR (Racing Research), were the two people who made it all happen for me. I rode for them for three years until I signed with Team Suzuki. I worked on the bikes during the week, and Greg would come to the races and help out. Greg was a professional race bike builder and liked his bikes immaculate. There was one week where I took a week off from working on the bikes, and I didn’t even clean the air filters. When Greg showed up at the races and saw the bikes he was upset, to say the least. Greg got on me about that, and that was the only time it ever happened. Greg put a lot of energy into two bikes. First there was the 1978 RM125 – he tricked the engine out and slapped a 23-inch wheel on the front for the last four nationals of the year. 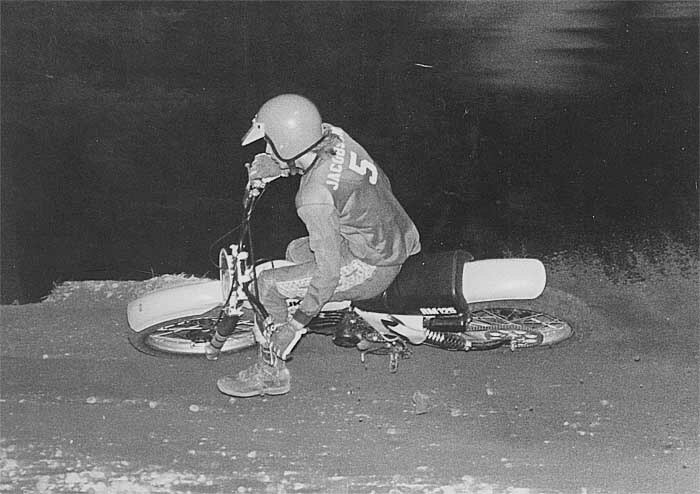 I didn’t care for the 23-inch much, but in 1978 the bike stayed up with Broc Glover’s factory Yamaha (he was right behind the leader, still don’t know who that guy was) for 25 minutes at my second National in Rhode Island, then my arms pumped up (which happened only in my early years at Puyallup) and I faded to 12th. Greg then built the 1979 RM 125 that I used at the first four ’79 125cc nationals. Greg was really good, and always supportive of me in whatever I asked him to do. BR:You were the last of the northwest MX racers to make an impact on the national scene. What was it that made you different from everybody else? PJ: I don’t know if I was all that different. There were a lot of good racers, and I looked up to all of them. I think if there was any advantage, it was that I wanted to do it and I wanted to be good. I lived a clean life and worked at it with help from my family, friends and sponsors. I had a slight advantage because I loved it more than anything else in the world, and I was committed to do the best I could. I’m not saying that I loved it more than anybody else who raced, but the reason I kind of did OK for a while was because of the combination of being totally committed and loving it. BR: Tell us about that last race. PJ: Well, that was August 5, 1979. It was at the fifth national in the first corner of the first moto of my first factory ride. I didn’t even get to ride one full race lap on a factory bike. I believe I had the shortest factory racing sponsorship in history, in that it lasted less than 10 seconds, just till the first corner. I worked hard all through high school, saying I was going to get a factory ride before I graduated. Two months before I graduated, after the fourth national, I signed the contract with Suzuki. I was standing fifth in the national points, one point behind Jeff Ward, three points behind Myerscough and ahead of Warren Reid. There I was, this lone privateer surrounded by factory bikes, so Suzuki asked me to ride the last half of the year for it. I arrived at the track for Friday’s practice with Greg Arnett, my Suzuki mechanic, and I went out on the first lap and gassed it over this jump, and the throttle stuck, and I had to let it fly. For a while after that I was a bit scared of the bike, it was fast. On Sunday I didn’t have to qualify because I was in the top ten in points. After the qualifiers were done I had to hang around for 25 minutes waiting for the ambulance to get there. One thing I remember is that I didn’t study how the starting gate fell, or where the best place to line up was. I just said I’m going to line up next to Broc Glover, because he’s the national champ. I wasn’t thinking of anything. I wasn’t preparing myself for the race like I had all the other times I had raced. I remember looking down at the gate and thinking, ‘I don’t know how fast the gate falls.’ It was on cement and it fell forward, but would it fall fast or slow or hesitate? I didn’t know. I got a mediocre start in about eighth spot, and I high sided when somebody came from the outside and took my front wheel out from under me. That was it! My dad was the first one to get to me, and I looked up and said, "Dad, I’m hurt bad." They had the bike running for me, waiting for me to get up, and I told them, "You might as well turn it off." That’s what happens sometimes. I don’t have any regrets, I loved racing. If I had to do it again, I would do it exactly the same, except I’d be a little more careful in the first corners. BR: Were you one of the first MX racers that became paralyzed? PJ: I’d heard about a couple of racers who were injured before that, but I didn’t know them. When I was racing I never thought you could get hurt and stay hurt. I knew you could get hurt and die, and that you could get hurt and get well, but the in between part didn’t enter my head. That probably helped me go a little faster sometimes, because I was either going to win, die or get better. Racers don’t think about the in between part too much. I injured my Thoracic 11th and 12th vertebrae (T 11/12) and bruised my spinal cord. I have feeling down my left hip, but not my right. I can’t move my legs at all, so I’m a Para (paraplegic). BR: What do you do for fun now? PJ: I have been in a bowling league for the past 15 years; I have played competitive tennis and basketball over the years, but now do that more for the fun than anything. In motorcycle racing terms, in tennis I got to the A class, but could never win it. I continue to play golf. Golfing is one of the most enjoyable things I do. I get to play with my dad, and we shoot about the same so that makes it interesting. Sometimes people give you a bad time about the wheelchair, and tell you, "You can’t go on the greens with that thing." I have big tires and don’t push on them if it’s wet or soft, so I don’t feel I hurt the greens. As a matter of fact I have some friends from Montana who are coming over this week, and we will play golf for a couple of days straight. I push myself or get a tow from a golf cart to travel the six odd miles of a golf course. I swing with one hand, and my average is about 107 (Able Bodies take note of your golf score!). I plan on getting one of the new hand cycles, they look like a lot of fun. That looks like something I could enjoy. I also go snowmobiling every once in a while, and you promised to take me out in your Pilot with Rob Hansen and go rip around in the dirt! So far, though, I haven’t come across anything that I ever took as seriously as racing motorcycles. I was lucky enough to come across one thing in life I was serious about, and I loved to put in the dedication to excel. BR: Where do you work today? PJ: After staying over two months in Texas recovering from the accident I met a guy on the airplane coming home. He said he worked for PACCAR (Kenworth/Peterbilt Trucks), and that if I ever wanted to get a job in computers to come and talk with him. A year later I went to talk to him, and I have been there ever since. I have been through a lot of jobs over the years at PACCAR, but I have been a computer network technician for the last 15 years. I maintain its data and voice network for over 400 truck dealers in North America. They’re good people that I work with, and I think I know almost everyone there. BR:How many nephews and nieces do you have today? PJ: I’m guessing at about 17 with all the kids through marriages, 11 directly. I skip their birthday gifts and save it all for Christmas. My nephew Dallas (Preston’s son) has a KX 80 and raced a little, but he’s not really into racing, and my other nephew (Pat) races bicycles at times. They are all great kids. BR: What has been your biggest obstacle over the last 22 years of being in a wheelchair? PJ: I still think about finishing one race on a factory bike just to see what would have happened. That has been something that has haunted me for so long. As far as being in the chair, it’s more of the mental viewpoint of freedom. You don’t feel as free as when you were walking, and were able to do something on the spur of the moment. You have to be more cautious and plan things out in advance when you’re in a wheelchair. I sometimes feel like William Wallace in the movie Braveheart where he said," It’s all for nothing if you don’t have freedom." BR:What are some of your goals? PJ: My heart was in racing, and I haven’t found anything to replace that heart. I would like to make a decent living, stay healthy and do things with my family and friends. I definitely am going to get a hand cycle, and maybe I will find the right gal someday – that may be a bit harder. It doesn’t bother me. I wait for them to ask, because normally if I ask they say no. I don’t know why they say that. Maybe it’s because of the chair, or maybe it’s because of me, probably both. I’ll wait for a gal to ask me. BR:Did riding more than one bike per race day help in your riding skills? PJ: It did make a big difference. The more you ride the more experience you get. I was never seriously injured during my racing career (well until the one day). I cracked my wrist practicing once (without falling, just held on too loose over some whoops) that put me out for three weeks, but that was the longest in a three-year period. BR: Who were you toughest competitors? PJ: Billy Joyce, Mark Gregson, Rick Burgett, Gary Racca, Eddie Davis, Chuck and Ron Sun, Buck Murphy, Phil Larson, Rick Benek and Tim Mitchlich in the northwest. Billy Joyce was my idol though, beside Roger DeCoster. I grew up near Billy, he lived a couple of blocks away. 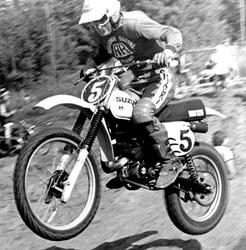 I would watch him race, and later on we would take XR 75s and run them into the ground together. He was three years older than I was, but at that young age it was an eternity. The first 125cc bike I ever raced on was his practice bike. He and my brother helped me out, both in riding together and talking. Nationally I raced in the Broc Glover, Bob Hannah, Mark Barnett, and Jeff Ward era. Even though Glover won the 125 Championship in 1979, Mark Barnett won the last three races on the bike I was hurt on, and was the fastest racer that year. If I compared myself against anybody it would be Jeff Ward. Jeff was the same age and was one point ahead of me in the championship, and I would beat him in one race and the next race he would beat me. Glover was dang good, Barnett was just plain fast and Hannah was unbelievable. I really enjoyed watching the Hurricane race in the Florida Winter Series in 1979 with my mom. In the super sandy and whooped out racecourses he would leave his 250 with the throttle pegged around the entire course. He would just jump over every whoop (the whole track was whoops) and land anywhere, without looking for a smooth landing. I came home and found a whoops and sand riding area on the tide flats in Fife. I then started to ride like Hannah on the balls of my feet, with my body way over the back and gassing it. I remember Burgett in his championship year of 1978 coming up to me after I had won a qualifier and saying, "Good ride!" That meant a lot to me, because he was at the top and took notice. BR: If you had never crashed in that first corner how do you think your career would have gone? PJ: I don’t know of course, but I think I could have done as well as Jeff Ward. I raced Jeff Ward, I was in front of him, behind him, I was in front of him and pulled away, he was in front of me and pulled away, I knew how he raced. Jeff had a little more national experience than I did, but we were very close in speed and endurance. BR: Do you ever talk to your old friends? PJ: Ever since the Supercross stopped in Seattle I don’t get to see anyone anymore. I would really like to go to the Dinosaur Daze vintage MX races and see some people next year, or the AHMRA National Vintage MX races in Chehalis. I would like to go to Washougal, but you get stuck in one place being in a wheelchair, so I would like to have a quad to get around the whole track.